Mobvoi's second generation "Express" and "Sport" smartwatches return with mixed results. The retooled E2 fails to impress with uninspired design and missing features, while the fitness-focused S2 blazes a trail for durable Wear OS smartwatches. Nestled among the absolute truckload of new smartwatches at CES 2019 were two fresh Wear OS devices from prolific Chinese smartwatch maker and AI company, Mobvoi. With the TicWatch E2 and TicWatch S2 — follow-ups to the first “Express” and “Sport” TicWatches released in mid-2018 — the brand is once again balancing specs and features with a mega-affordable price tag, and tackling some of the criticisms levelled at its predecessors. Mobvoi is on a bit of a hot streak following the launches of the excellent TicWatch Pro and the equally great TicWatch C2, but can it carry that momentum forward in 2019 with its entry-level wearables? Find out in this TicWatch E2 and TicWatch S2 review! Mobvoi TicWatch E2 and S2 review notes: I’ve been switching between using the TicWatch E2 (model WG12026) and TicWatch S2 (WG12016) as my main smartwatch for just over two weeks. Both watches were running Wear OS 2.2 based on Android 8.0 Oreo and were connected to a Google Pixel 3 XL for the review. While there are notable differences between the two wearables, they are very much sister devices as that share much of the same specs and features. With that in mind we decided to look at both watches in a single review so buyers can decide which better suits their needs. If you’re hunting for a wearable that looks and feels like a luxury watch, keep on hunting. The TicWatch E2 and S2 are both constructed from lightweight polycarbonate. Unlike the original TicWatch E, which had a transparent plastic shell, Mobvoi has made no attempt at disguising the use of plastic and it lacks the premium feel many will want from a smartwatch. What you lose in aesthetics you do gain back in durability (especially with the S2 — more on that later), as both will be able to weather bumps and scratches better than a metal smartwatch. Despite being thinner than the first-generation watches, the S2 and E2 are also a bit bulkier, likely due to the increased battery size. Those with thicker wrists won’t care too much, but if you’re on the slight side I’d suggest trying them out (or at least checking the retailer returns policy) before parting with your cash. As for the key design differences between the two, the E2 looks like an everyday watch with a round face, a single circular physical button, and a thinly ribbed bezel. The S2, meanwhile, is a sports watch through and through with a numbered bezel and a chequered pattern around the edge. It’s a bit of a shame the bezel doesn’t rotate like the Samsung Galaxy Watch, but remember, there’s a huge price disparity between the two wearables. The S2 also has a larger rectangular-shaped button with a textured finish so you can find it easily even during a sweaty workout. Personally, I much prefer the S2’s overall look. In an attempt to make the watch appeal to everyone, the E2 lacks an identity and falls into the trap of appearing bland and nondescript. The sportier S2, on the other hand, looks far more suited to its polycarbonate body and should appeal to its target market of fitness fanatics. The E2 is a little bland, but the sportier S2 looks the part. I got my hands (should that be wrists?) on the E2 and S2 in a matte black finish. A white version of the S2 is planned for Q1 2019. The E2 and S2 come with interchangeable 22mm silicone straps, which are very comfortable and pleasantly tactile. It’s great you can now swap the bands at your leisure, unlike the original TicWatch S, which built the GPS into the strap. As with the TicWatch C2 I tested recently, the E2 and S2 have protruding heart rate monitors on the underside which leave imprints in your wrist after you take them off, but it never caused me any real discomfort. While the TicWatch E2 and S2 have enjoyed a few design tweaks over the first-generation, the real upgrades are all under the hood. One of the most significant improvements is the 5ATM rating, which ensures both watches are capable of withstanding water pressure up to 50m depth for ten minutes. In layman’s terms, that means the E2 and S2 are swim- and surf-ready. This matches some of the more expensive fitness-focused smartwatches and is a real plus for a casual surfer like me. If you’re a real extreme sports enthusiast, however, you’ll absolutely want to go for the S2 as Mobvoi’s wearable is rated MIL-STD-810G for U.S. military standard durability. Said rating means the S2 can survive temperature shock between -30 degrees to 70 degrees C (and remain functional between -20 degrees C to 55 degrees C), withstand up to 7kpa pressure, 44 degrees C solar radiation, 95 percent humidity, and various other extreme conditions. Both watches enjoy a decent leap in the battery department, with the 300mAh cell found in the original E and S boosted up to 415mAh for the E2 and S2. Mobvoi says this represents a 30 percent increase. Unfortunately that still doesn’t put the watches anywhere near the top of the smartwatch ladder in endurance. I averaged a day and a half to two days before having to reach for the bundled magnetic charger, with the lower range coming after prolonged workouts and heavy app usage. There are certainly better options out there if you want a smartwatch with far longer battery life, even at this price range (and in some cases below). The E2 and S2 also have brand new processors, with Mobvoi ditching MediaTek chipsets for the ubiquitous Snapdragon Wear 2100 backed by 512MB of RAM and 4GB of onboard storage. I went into great detail about my concerns with Mobvoi still using older Qualcomm silicon in its wearables and not the Snapdragon Wear 3100 in my TicWatch C2 review. Those concerns are still relevant for the E2 and S2, but it’s more palatable at this lower price, plus you know you’re getting the same processing power as Mobvoi’s more expensive smartwatches. 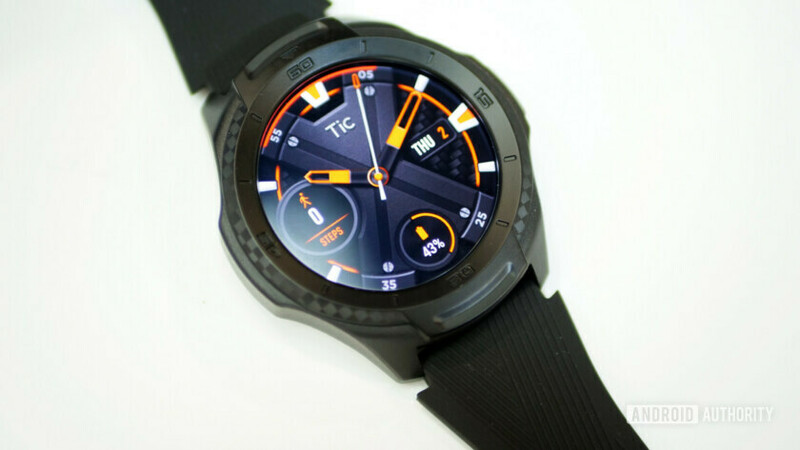 In addition to an identical connectivity suite — GPS, GLONASS, and Beidou for navigation and Bluetooth 4.1/Wi-Fi — both watches also share the same 1.39-inch AMOLED display with a 400 x 400 resolution. Viewing angles are great and the “always on” feature means you’ll never have a black screen without destroying your battery life. For a pair of smartwatches that cost under $180, it’s fair to say you’re getting your money’s worth in terms of hardware with either device. There are two notable omissions, however. The first is the lack of a speaker, which is even more strange when you consider the E and S both had one. That means no taking calls or audio playback of any kind. There is a mic for voice commands, at least. The other missing feature is Google Pay support or any kind of contactless payments as neither watch has NFC. Android Authority’s Jimmy Westenberg chatted with Mobvoi representatives about the decision not to include NFC at CES 2019. Mobvoi’s apparent rationale was that contactless payments would be among the least requested features among users looking for an affordable smartwatch, if put to a vote. Honestly, I’m not sure I’m on board with the arbitrary argument that users should have to pick which features get overlooked, or that a hypothetical user poll is a great basis for choosing what functionality gets cut. This is clearly a conscious decision to skip over a core smartwatch feature to reduce the price. I personally think it’s reasonable to expect contactless payment support at this price range. There’s every chance it could be a deal breaker for some. It’s easy to forget that Mobvoi is at heart an AI company. The TicWatch E2 and S2 are seemingly the first wearables from the Chinese brand to actually embrace this heritage via its TicMotion platform. Much like Mobvoi’s other TicWatch products, the E2 and S2 are loaded with fitness features. Most link back into the TicHealth app which appears by swiping left from the main screen (although you can switch this to Google Fit as default with a long press). The TicHealth suite on the E2 and S2 can track six different workout presets — outdoor run, outdoor walk, indoor run, cycling, free style, and pool swim — complete with options for constant heart rate and location tracking, and other useful stats generated by the watches’ many sensors. However, the AI-powered TicMotion functionality really gives the E2 and S2 an edge as fitness trackers. These proactive features utilize Mobvoi’s “invisible” AI algorithms to automatically monitor your activity throughout the day, all without having to select a specific workout first. This is great if you keep forgetting to hit start before heading out for a hazy morning run like me. Mobvoi also says it will add sleep tracking to the tracking suite in the future. TicMotion finally sees TicWatch products taking advantage of Mobvoi's AI heritage. Swim tracking uses machine learning to recognize how many laps and strokes (and which stroke types) you’re making during each dip in the pool. Both watches can also generate Swim Golf (SWOLF) scores, which is a really useful way of measuring your swimming efficiency without going through the hassle of timing your laps and counting your strokes. Mobvoi has talked up future additions to TicMotion like fall detection, gesture control, and personalized workouts, but these were not live at the time of review. Unfortunately, Mobvoi’s smartphone app is still sorely lacking as a companion app for TicWatch products. The barebones app’s health center shows much of the same data you see in the Wear OS TicHealth app. Aside from a store tab, the only other main section in the smartphone app is for Mobvoi’s smart home devices. You’re much better off grabbing one of the Play Store’s many excellent fitness tracking apps instead. Speaking of the Play Store, the TicWatch E2 and S2 benefit from all the pros (and the cons) of Google’s Wear OS platform, including an ever-growing number of apps via the shrunk down Play Store it offers. Wear OS is still divisive, but if you haven’t tried a smartwatch since the dark days of Android Wear you’ll be astounded at how far the platform has come. The recent redesign, which leans heavily on Google Assistant as both a voice assistant and a content feed, is streamlined, user-friendly, and more customizable than ever. Both watches have a number of preloaded watch faces, including a couple of minimalist-style designs that I really liked. Of course, If nothing strikes your fancy, you can always head over to the Play Store where there are plenty of great watch face apps for Wear OS. Before publishing this review, Mobvoi reached out to say there are currently “inconsistencies” with the heart rate monitor for both watches on the software running out of the box. I personally didn’t see any irregularities during my testing, but Mobvoi says these issues will be fixed in the next batch of Wear OS software updates due before both devices go up for sale. Wear OS 2.3 has just started rolling out although I haven’t received the update just yet on either device. The TicWatch E2 is priced at $159.99 (~145.99 pounds/159.99 euros) and the TicWatch S2 is priced at $179.99 (~165.99 pounds/179.99 euros). You can grab either watch from Mobvoi’s online store or Amazon. Overall, both watches are decent additions to the TicWatch family, though I came away a little underwhelmed by the TicWatch E2. Mobvoi sells the original TicWatch E for just $129. Unless you want to take your smartwatch for a swim or surf, the largely negligible battery and processor upgrades and uninspired design tweaks aren’t really enough to justify the extra $30. The E2 is still an incredibly affordable Wear OS smartwatch, but if you’re happy to look outside of Google’s ecosystem, there are other, cheaper options. For example, the Amazfit Bip ($79) has far better battery life and links back to Xiaomi’s excellent Mi Fit app. The TicWatch S2 is the real star of the show. The TicWatch S2 is a completely different story, however. The lack of NFC stings, but the S2 makes up for it with a robust design and that highly desirable MIL-STD rating. You’d be hard pressed to find a better option if you’re looking for an ultra-durable, Wear OS-powered fitness smartwatch on a budget. If you want better battery life and contactless payments the Fitbit Versa ($199) is undoubtedly the best alternative for just a small price bump. If you can find them on sale, the Garmin Vivoactive 3 Music ($249) or even the Samsung Gear Sport ($179) are also worth a look. For Wear OS fans, however, the TicWatch S2 is a worthy leap over the already great TicWatch S. It won’t let you down even in the most extreme circumstances.